We are in love with this salad. It’s tough to eat cold, raw veggies in the winter when it’s cold. Eating with the seasons, our bodies crave warm, comforting foods that will both physically and energetically get our digestive fire going. However, there’s something about salads that is always so refreshing and uplifting and just makes use feel healthy. That’s where balance comes in. There is a way to enjoy salad in the winter, with a little bit of extra care and creativity. To do this, we combine some cooked veggies with some raw veggies, so there’s a little bit of fresh, vibrance mixed with comfort and warmth. In this salad we use roasted cauliflower and roasted beets. It’s optional to lightly saute the kale and brussels sprouts. If you prefer, you can keep these raw. We like to add in some freshly slivered radishes to provide that crisp bite. And, lastly, adding in some refreshing grapefruit and orange really rounds out the salad and adds some beautiful colour! This recipe is actually ideal to make with leftovers. 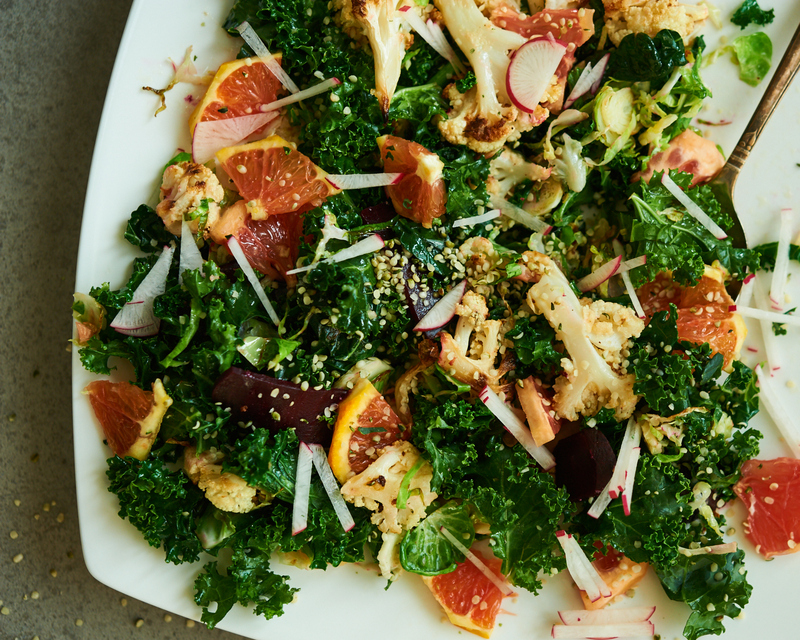 If you roast some cauliflower and beets the day or two before you make this salad, then you can eat some of them for another meal and then use the rest in this salad recipe. 1. If you have leftover roasted cauliflower and beets, yay! If you don’t have them ready yet, then chop the cauliflower into florets. Spread out on a baking sheet and toss with olive oil and sea salt. Roast at 375 for 30 minutes, or until beginning to crisp on edges. If you need to roast the beets, rinse them well and cut away any dirty parts. Wrap up in some tin foil with a drizzle of olive oil, sea salt and pepper. Roast for 1 hour, or until the beets are soft. Then the skin will peel off easily. Slice into thin pieces. 2. Rinse off the kale and dry well. Chop into smaller pieces. 3. Sliver the brussels sprouts as thinly as you can. 4. Optional: If you prefer that the kale and brussels sprouts are cooked, lightly saute them in some extra virgin olive oil with sea salt. It’s best to saute them separately and then toss together after. 6. Combine all the veggies and toss together. 7. Make vinaigrette and drizzle on top.